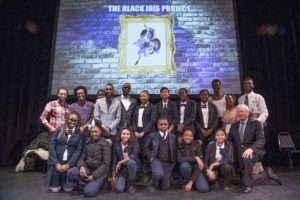 The Black Iris Project took center stage at Con Edison and The Town Hall’s 20th anniversary Black History Month celebration on Monday and Tuesday, February 6-7 at the historic theatre located at 123 West 43rd Street in Manhattan. The programs marked two decades of providing free Broadway performances for public school children. This year’s featured artist, award-winning choreographer and The Black Iris founder Jeremy McQueen, premiered “Black Excellence,” a unique ballet showcasing five artists from the Harlem Renaissance. Five classically-trained dancers recreated brief histories of poet Langston Hughes, sculptor Augusta Savage, singer Nina Simone, trumpeter Dizzy Gillespie and Dance Theatre of Harlem founder Arthur Mitchell. Over the past 20 years, Con Edison and the Town Hall guests have included The Young Hoofers, The Persuasions, percussionist Jeff Haynes, Toshi Reagon, Jawole Willa Jo Zollar and the Urban Bush Women, Ishangi Family African Dancers, Women of the Calabash, and many more. Built in 1921 by a group of suffragettes The Town Hall began as a lecture hall and public forum for debates. Landmarked in 1979, it has become widely known for its outstanding acoustics and eclectic music programs. Over the decades the stage has been graced by Eleanor Roosevelt, Billie Holiday, Igor Stravinsky, Marian Anderson, Bob Dylan, Miles Davis, Billy Joel and Blondie. Today the hall flourishes as a popular, affordable venue, boasting the hottest acts in rock, pop, folk, cabaret, world music, comedy and dance, including Ravi Shankar, Elvis Costello, Eddie Izzard, Natalie Merchant, Graham Nash, Liza Minelli, Gillian Welch, Cyndi Lauper, Rufus Wainright, Norah Jones, Margaret Cho and Andre Watts. For over a decade, The Town Hall has hosted live broadcasts of Garrison Keillor’s Prairie Home Companion.